Blueberries are one of the best fruits to incorporate into a healthy diet. They are low in calories and full of antioxidants and vitamin C. The nutrients in blueberries are beneficial to your heart, digestive system and eyes. Cooking with dried blueberries is not difficult; you can add them easily to granola mixes, combine them with other ingredients in baked recipes, or rehydrate them if you are making a recipe that calls for fresh fruit. Create your own homemade granola by combining 1 cup of dried blueberries with 3 cups of rolled oats, 1/2 cup of sunflower seeds, 1/2 cup of almonds, 1/4 cup of wheat germ, 1/2 cup of brown sugar, and 1 tbsp. of cinnamon. Add 1/2 cup of melted butter and 1/2 cup of honey to the dry ingredients and mix them well. Put the mixture in a 13-by-9-inch baking tray and bake it in a 350-degree Fahrenheit oven for 15 minutes. Stir the mixture every five minutes. Remove the granola from the oven, allow the mixture to cool, and store it in a sealed container. 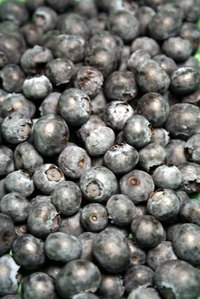 Use dried blueberries when you are making a recipe that produces a thick or heavy batter that would normally cause fresh or frozen blueberries to break or bleed. Make blueberry muffins by combining 1 3/4 cups of flour, 2 1/2 tsp. of baking powder, 1/2 tsp. of baking soda, 3/4 tsp. of salt, 1/4 cup of sugar, and 1 cup of dried blueberries in a large bowl. Add one egg, 1 cup of milk, and 4 oz. of melted butter. Mix well and pour the mixture into greased muffin tins. Bake at 400 degrees Fahrenheit for 25 minutes. Create mini blueberry muffins by using a mini-muffin tin and adjusting the baking time to 12 to 15 minutes. To rehydrate dried blueberries, add 1 cup of blueberries and 1 cup of water to a bowl. Mix well, cover the blueberries and refrigerate them overnight. Add the rehydrated blueberries to recipes for pancakes, cakes and muffins. Make blueberry sauce by adding 3 cups of the rehydrated blueberries to a sauce pan containing 1 cup of sugar, 1/2 tbsp. of cornstarch, 2/3 cup of water, 1 tbsp. of lemon zest, 1/8 tsp. of cinnamon, and 1/8 tsp. of salt. Cook over medium heat until the liquid thickens. Taste the sauce and add more sugar if necessary. Let the blueberries cool and store them in the refrigerator. A tutorial on how to make classic blueberry muffins. An easy recipe that comes out tasting like bakery-style muffins.